I am building a retro gaming display for my living room to play games like Tetris or Snake with a wireless controller while I am sitting on my sofa. 10 columns of WS2812 LED stripes are integrated in a lasercutted MDF frame, which is covered by a transparent wood veneer. The heart of the system is a Raspberry Pi A+ which is integrated in the MDF frame. This Pi is connected to an Arduino driving the LED stripes. Four 8x8 Matrix displays are combined to a highscore display which is also connected to the Pi via SPI. The wireless controller is based on an ESP8266-IoT-board, which connects to the Pi over Wi-Fi. A Joystick and four Arcade buttons are used for game controlling. The controller is powered by a LiPo and could be charged by a microUSB connector. Based on the python_games package coming with Raspbian, all games are written in Python. After discussing this issue with several people who want to build their own matrix, I decided to sum up the main points in a project log. I didn&apos;t have time to test this, but it looks quite straight forward. Also if there are other solutions, I will update this post. Of course, it is also possible to reduce display update timings to reduce the UART speed to 250k. 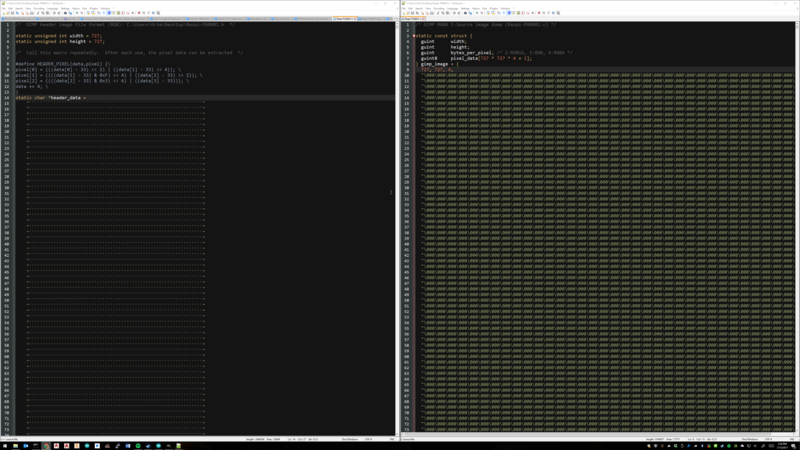 I just started to play around with parsing data from internet sources to the matrix. After several questions regarding code adaption for different matrix sizes, python code now has global pixel settings called PIXEL_X and PIXEL_Y. I have uploaded the Arduino sketch of the ESP8266 based controller to Github. Wiring is pretty simple, using a Sparkfun Thing and a single cell LiPo. Instead of the retro controller there is also a small Android app for game control. It provides the same functionality, so no additional controller hardware is needed if you already have an Android device. Python code and Arduino sketch now on Github. I will add more documentation how to use the code within the next week. In reply to a comment, I will describe how to apply the veneer paper to the MDF matrix. The veneer I have used, is called Microwood, which is a 0.1 mm veneer with paper backing. The following image shows the veneer glued on the MDF sanded off (right) in comparison to the veneer glued on the more or less black MDF. For me, this difference was not enough to polish all the MDF parts and the final result proved me right. Because of the paper backing, it is quite easy to apply the veneer and there is no problem with dissolving, although the veneer was rolled up when it arrived. I have now uploaded the DXF files of the MDF matrix. I have used 3mm MDF. The next version will be a combination of MDF and cardboard to save some cost. Running Python code on the Pi makes it so easy to realize new features. This is a quick preview of getting a weather forecast on the LED matrix. Using PyOWM to talk to OpenWeaterMap and some 10x10 pixel weather icons, that&apos;s it. 1. How to move clock and icons to the center of the matrix? It&apos;s displays clock and icons in the upper corner like if i use 10x20 matrix. 2. How to make a speed of blocks in tetris game faster? 3. How to make a speed of snake in snake game faster? 4. How to make a speed of ball in pong game faster? 5. How to fix a ghost right wall in pong game? The ball is repelled from the invisible wall to the right. It&apos;s displays game like if i use 10x32 matrix. 1. You have to change the drawNumber calls in the drawClock function. drawNumber gets an offset for x and y as a parameter, so please adapt this clues to your matrix. 5. Did you changed the PIXEL_X and PIXEL_Y? P.S. I have an idea to make an instruction how i build a changed Yours project for giant matrix and diferent controllers. Thank you for the video, it looks absolutely fantastic, would be great to see an instruction. If you want you can also join this project on hackaday, I have many ideas how to change the python code for additional pixels. Hi, I hope you have a great day. I try to use your code on a 22*87 matrix (1914 WS2812B). Everything works as expected as long as I don&apos;t exceed 14*20. Even if I change the buffer size and lower the speed of the UART nothing appared on the matrix. Maybe you have an idea for helping me? Which Arduino do you use? Could be an SRAM issue. You can also try to decrease the update rate in the Python code to decrease UART load. It is quite a lot of data to transfer! Hi. I have a question how to set uart between rpi 3b+ and arduino nano. I already use logic level converter. Maybe I need an extra sketch for arduino or special soft, python module? You also need pythons-serial lib. Still try to connect pi and arduino by uart:( Maybe You have variant of py file without arduino and uart? Hello, maybe you have the connection schema of the matrix, i&apos;ll be thankful if you can help me with that. Hello, there is no document right now, but I have started in the lower left corner and then zig-zag connected the stripes ending in lower right corner with the last pixel. Power is distributed to all the stripes from the lower side (you can see it on one of my first project logs). is there any preferred supplier for laser cutting of the MDF material? formulor.de is one option, cost approx. 200 euro for one complete set. any suggestion for other suppliers / less costs? For lower costs, maybe use "Finnpappe" instead of MDF, but it has a different thickness, so you have to change the design. Today I would go to the next fablab to do the laser job. The app currently only works for Android version lower than 7.0. Please send me a PM. very cool project and I just had a look to the software packages required. Obviously the MAX7219 library of the referenced source has changed a lot as it has been developed further on with new features. Is there a quick fix to use the new library or is everybody using the previous version? I assume it is all under python3, correct? Thanks! I didn&apos;t look at the new lib yet, I will try soon. Just joined this project. I&apos;m involved in a hack-a-thon event at work and this project is what we&apos;re going to use to get familiar with Python. My problem is that I can&apos;t find any of the supporting files to load into the Pi and the Arduino. Thanks! It&apos;s looking good so far. My LED matrix is 10 columns x 30 rows. (An impressive sight) Just need to figure out how to load the MAX7219 library and I should be off and running. Hello. I have a problem with your project. Im working on this now, but I cant connect with led matrix. When I execute games.py and controller sim, I can see tetris on my monitor, but I cant see nothing on my led matrix. I found your project by reading much about led coffee tables. And now i am building my own table and i would like to use your code. Later i hope i can integrate the table to fhem. My matrix is 24 X 14 and i use ws2812B, a raspberry3 and an arduino nano. I set the baudrate up to 1.000.000. My problem seems like the same from grim, posted 03.07.17 in his gallery. You were ready to betray, how do you make the android app? please send me a pm and I will send you the android app. Very nice Porject, but i have many problems to run the phyton scripts on my rpi zero. This is my first contact with python an the &apos;controller_sim.py&apos; returns an &apos;segment fault&apos;. Also it is not possible to run the &apos;games_pi.py&apos; script. The library &apos;socketserver&apos; isn&apos;t found and i could not install the module PIL. Has somebody run this script on pi zero? controller_sim is a simulator to test the code on a PC, so not needed for running the code on a Pi. Please use python3 for socketserver. For some reason I cannot reply to the other comments. However I had a question about the "boot logo" that the teensy displays during the Pi&apos;s boot. How did you create that? I am looking to change it however I&apos;m not sure why but when I change the code, I get a crash. Thanks. That&apos;s awesome! Thanks for sharing the image! For the boot logo i have used GIMP, because it has an option to export c files (.c or .h). Afterwards you can edit the image in a text editor. I am back from summer vacation, sorry for the delay. It&apos;s been a long time ago, maybe I&apos;m wrong. I tried gimp for sure, but maybe later I used a different tool to convert RGB bin data to Hex string, ending up with tools like Matlab/Octave or something else. If I find the tool again, I&apos;ll let you know. Did you changed in simulation mode first? I will test it over the weekend and come back to you soon. Could be a timing issue, because you have 2.5x more LEDs. Are you using the same PI/Arduino setup at 500kbaud? Also, I am currently using an Arduino Mega and RPi3. I was originally intending to use the teensy 3.6 however your provided sketch is not compatible with the teensy 3.6. Did you changed the pixel values in the drawBoard function (line 1042)? Pong does not scale yet, sorry for the code, it was really quick and dirty. For changing the clock size, you have to change the font via the clock_font array. How is your progress? this is really great stuff!!! I´m very interested in your controller. Can you give me some details on wiring and code? Hi - Thanks for sharing! Working on something very similar with my son for a Christmas project. Any chance of posting any of your code? Would give us a great starting point for our own project - this is, by a mile, the most ambitious project we&apos;ve undertaken and we&apos;re a bit in over our heads. Either way, thanks again for sharing! Thanks! I see now that you had already posted that link. I don&apos;t know how I missed it. Sorry about that. Thanks anyway for the fast reply! I have been looking for a project like yours for long time! I&apos;m pretty new to Raspberry Pi. Is there an easy way to connect controller directly without having to change too much code? Instead of wifi. Sure, you can connect a keyboard or gamepad to the Pi via USB. 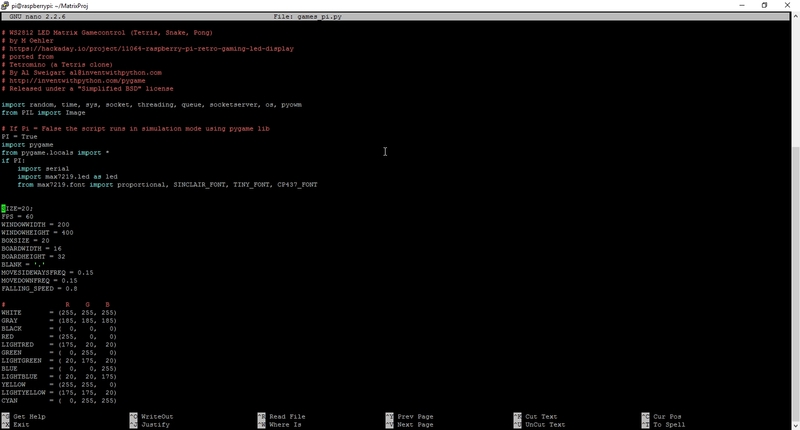 Then use the event system from the pygame lib which I have used in the controller_sim.py. Only small changes in the code are necessary, if you tell me your controller type, I will provide you some example code. All these projects are very interesting. So much talent, so many great ideas. Any updates coming soon? Would love to get more detail on this. Quite busy these days, next updates will be a schematic and some details regarding the MDF frame and a more detailed part list. Fantastic. Looking forward to it. You are about to report the project "Raspberry Pi Retro Gaming LED Display", please tell us the reason.